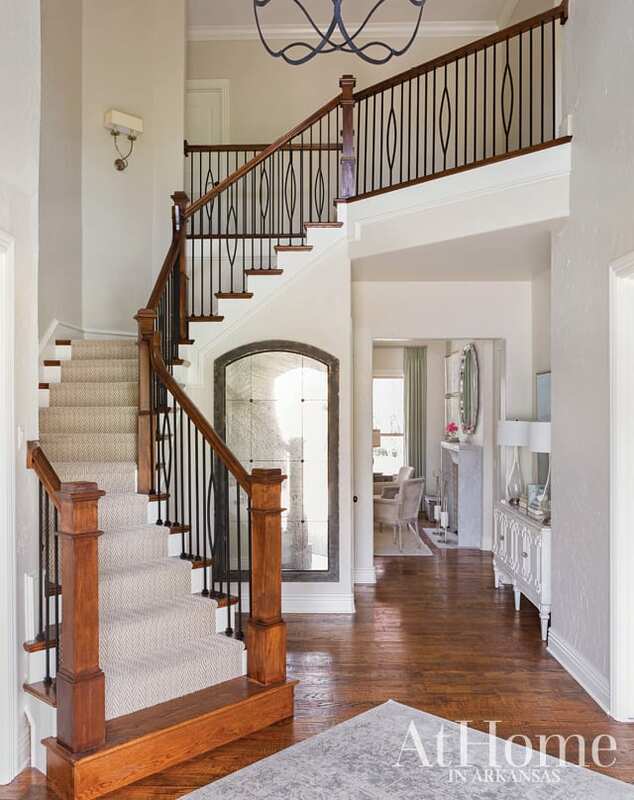 To make the house feel like the McCulleys’, every wall was painted, every light fixture was changed out, and the master bath and kitchen were both gutted. “Overall, we simplified the house and gave it a younger feel,” the designer says. 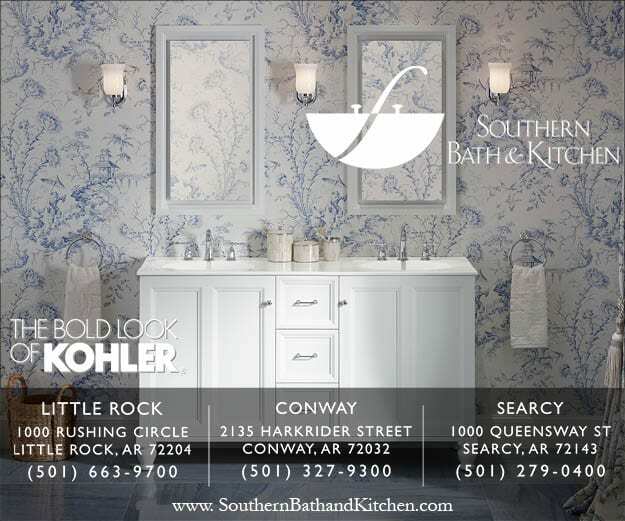 The kitchen was one of two spaces (the master bath being the second) that received a complete overhaul. The hallway was extended to allow for more cabinetry, and the adjoining breakfast nook’s square footage was also added to the kitchen’s footprint. 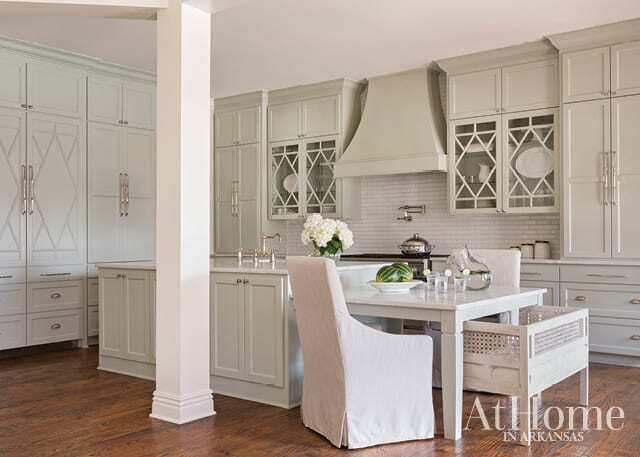 As for the cabinetry, Katie notes its hue (“Cromarty” by Farrow & Ball) set the tone for the rest of the house. 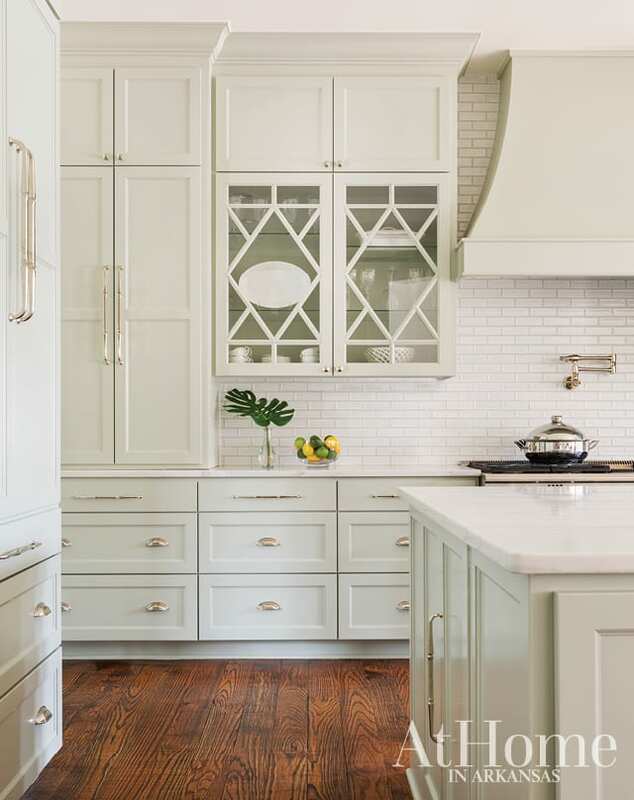 “It’s rare that I have a client who will take a risk on cabinetry color,” Katie says. “But I think this resembles the young, fun family they are and also speaks to their love of coastal style without being too beachy.” A ceramic subway tile backsplash, quartz countertops, and concealed appliances finish the polished yet comfortable design. The bed from the couple’s previous home made the move but was updated with new linens. A separate sitting area features two chairs that previously had dark wood and zebra-printed upholstery. 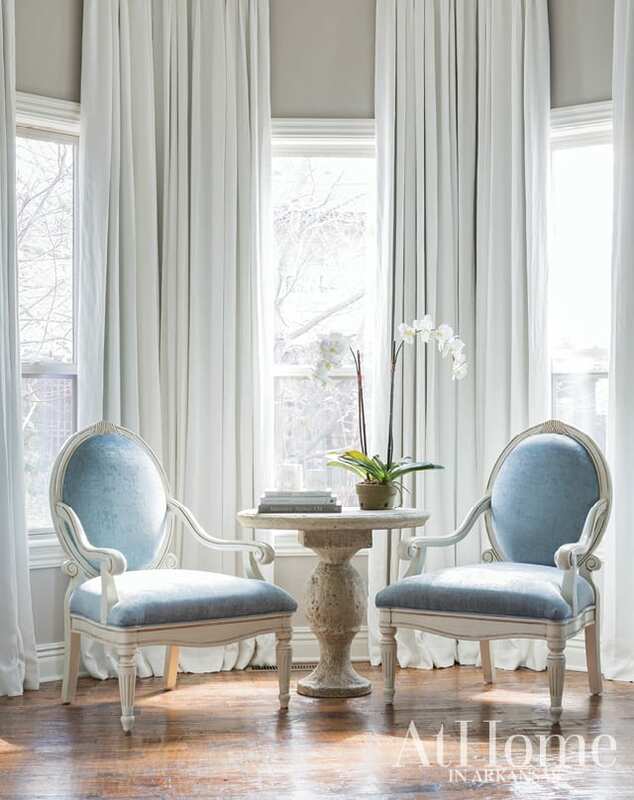 Katie refreshed the pair with a coat of paint and a light blue fabric that coordinates with the home’s overall palette. 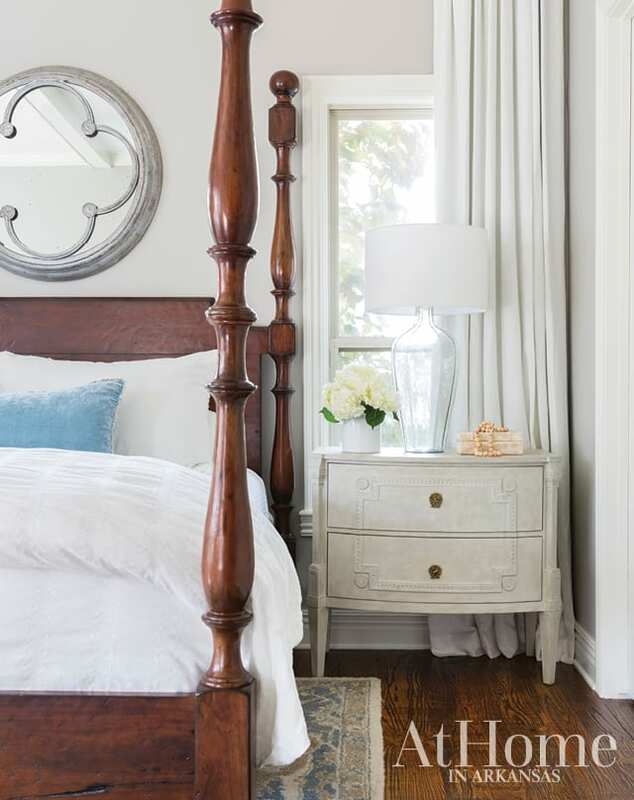 Tall linen curtains lend a casual air to the room. 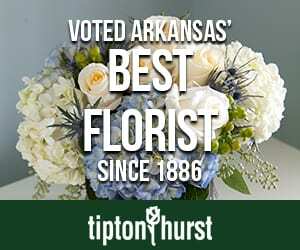 “The master space was lacking in our last house; it was small. So, we had the opportunity to do something we loved here. Katie did a great job making it spa-like,” Brooke says. 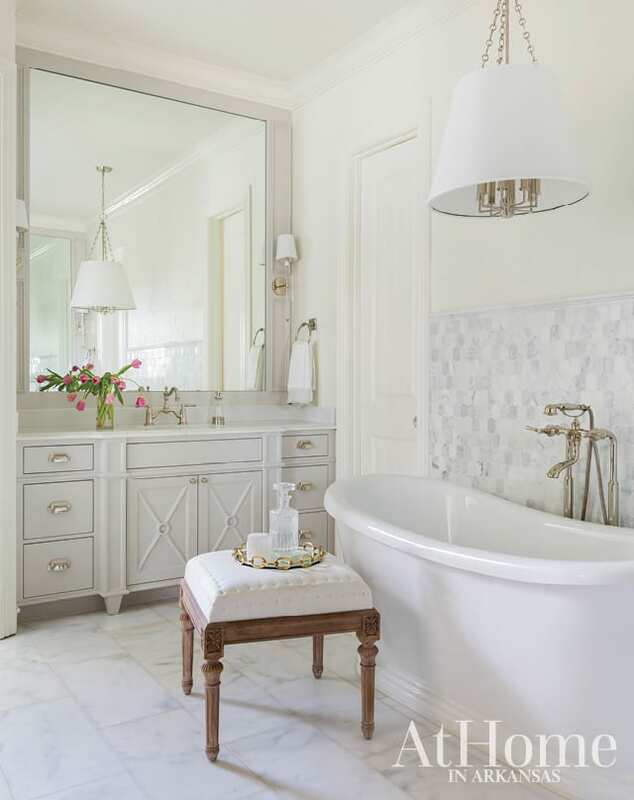 The master bath was gutted but retained its original layout. 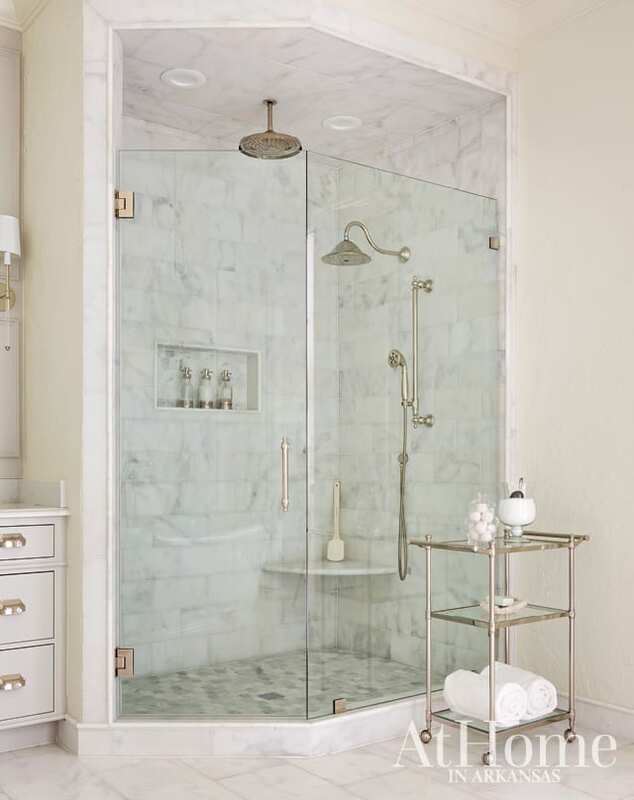 Newly installed matching vanities bring symmetry to the design, while three different kinds of marble add visual interest to the countertops, walls, shower, and floor— without any one area attracting more attention than another. A drum shade chandelier is an understated addition to the scheme, and Lucite sconces at the vanity add a touch of glamour and sophistication. The former laundry room was outfitted with dark green cabinetry and an ornate light fixture. Katie retained the room’s layout but updated the space to suit the McCulleys, starting with a blue-green cement tile that was selected for the flooring. The cabinetry received a fresh coat of paint along with new hardware. A ceramic backsplash with a geometric motif and quartz countertops complete the fun and functional space. The McCulleys’ 6-year-old daughter transitioned into a “big girl room” with the move to the new house. “It was really her first time to get to express herself creatively in her room,” Brooke says. 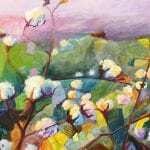 The navy and pink palette was inspired by a picture Brooke sent to Katie. 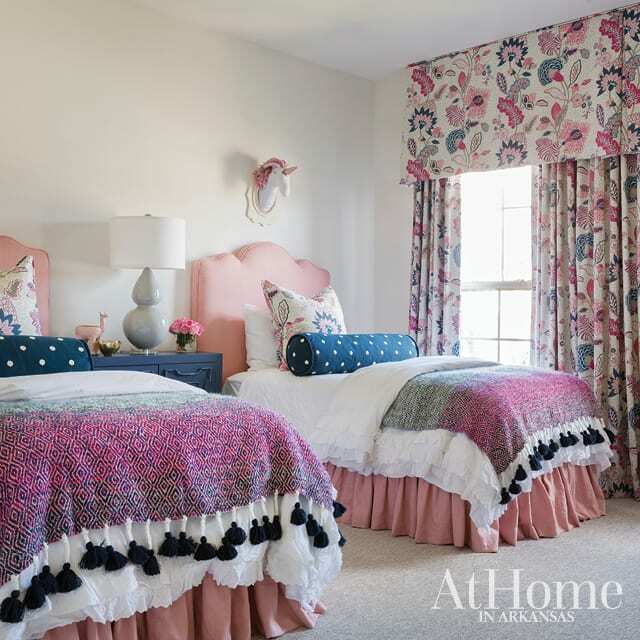 A Duralee paisley fabric incorporates a garden-like influence on the draperies and throw pillows, while a unicorn wall hanging and pom-tasseled blankets keep the look light and fun. “We went a little older in this room, so he could grow into it,” Katie says of the McCulleys’ 9-year-old son’s room. 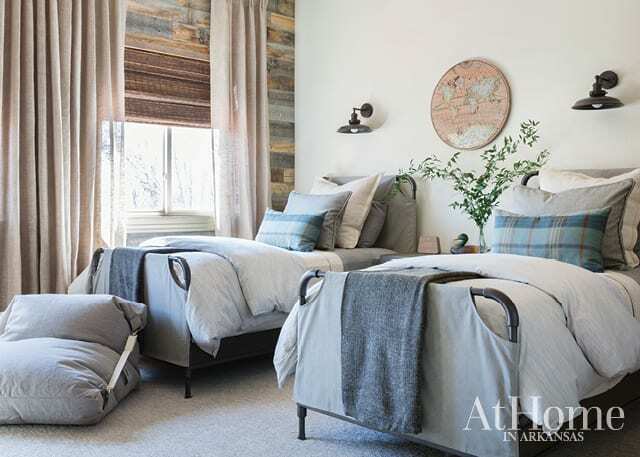 “Everything Brooke sent me had a lodge/Restoration Hardware feel.” An existing wood-plank wall was retained and complemented with custom bedding and accents that reflect the boy’s love of the outdoors and hunting. 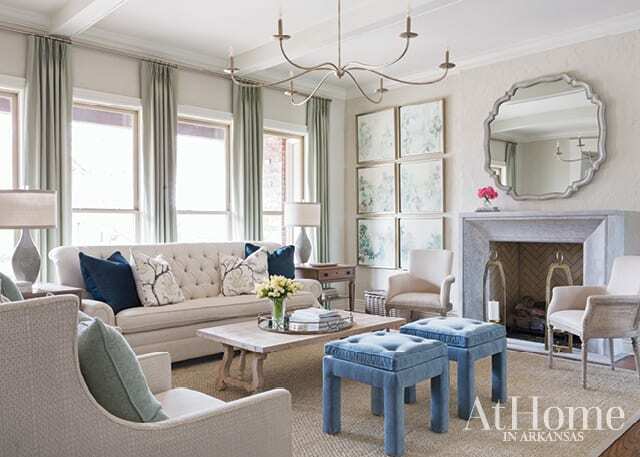 “I love that so much of this room is timeless,” Brooke says.